Recently we have seen many online shops with Black Friday sale. Now obviously is time for Cyber Monday which is also coming on Gearbest, they have prepared many products like smartphones, smartwatches, led lights, flashlights and many more. 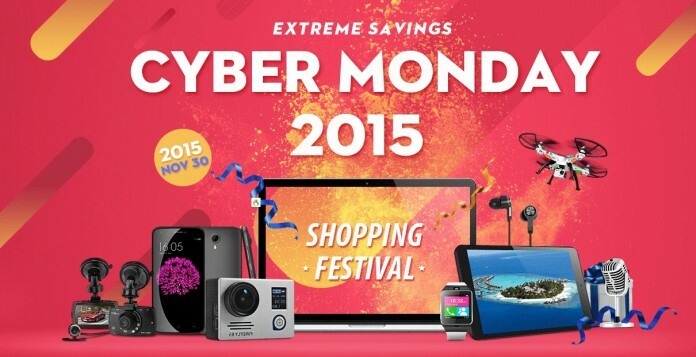 Cyber Monday is special shopping day on Monday after the Thanksgiving holiday in the United States. From what I know it is more or less the same shopping sale like Black Friday just on different day. So you can expect many different products with lower prices than usual. So, the Gearbest Cyber Monday promotion starts from 8:00am, 30th November(GMT+8) to 8:00am, 2th December(GMT+8). In this period you have opportunity to buy something cheaper than usual, so I strongly suggest that you visit this link. Where you can see what they have prepared, but I am 100% sure that you will definitely find something for you or maybe your friend.